The Election Commission of India has asked the Loksatta Party to explain its pledge to support GM (genetically modified) crops whereas it has given notices to the TDP and YSRCP on their promises to waive loans of farmers and self-help groups. State Loksatta Party President Katari Srinivasa Rao told media here today that the Election Commission wanted to know how the Loksatta could promise to promote GM crops when the Supreme Court was seized of a petition filed by Loksatta Party national President Dr. Jayaprakash Narayan on GM crops. Katari clarified that the Loksatta and some farmers’ organizations in their petitions took exception to exclusion of agricultural experts from the committee that gives clearance for field trials of GM crops. It does not deal with the desirability or otherwise of GM crops. Katari said that while most political parties have either opposed introduction of GM crops or adopted an ambivalent attitude, the Loksatta Party has boldly and unequivocally decided in favor of GM crops to ensure higher incomes to farmers and nutritious food to all. The Loksatta stance is in consonance with Article 43 of the Constitution which mandates that the State shall endeavor to ensure a decent standard of life to those engaged in agriculture etc and Article 48 which mandates that the State shall endeavor to organize agriculture on modern and scientific lines and preserve and improve crop varieties. Katari recalled that the Supreme Court in one of its verdicts has said that political party manifestos should be in tune with the Directive Principles of the Constitution and enable people to live and grow with self-respect. 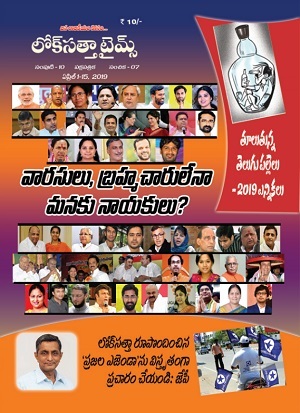 The Loksatta election manifesto does it precisely by focusing on issues like education, healthcare and employment opportunities while traditional parties dangle loan waivers and freebies to garner votes. The Loksatta is, however, in favor of merit subsidies which enable people to become self-reliant and live with dignity. Mr. P. Bhaskara Rao, State Convener of the party’s farmers’ wing, took part in the media conference. 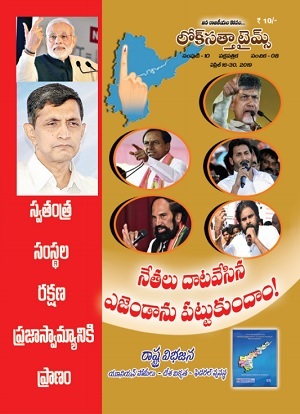 Katari announced that the Loksatta is fielding candidates for 118 Assembly seats – 73 in Andhra Pradesh and 45 in Telangana – and one Lok Sabha seat (Malkajgiri) in Telangana. Katari said that 50 percent of the candidates named today are BCs, SCs and minorities. The party also announced a nine-member campaign committee with Mr. Allu Siva Ramesh Reddy as Convener for Andhra Pradesh. Its members are: Messrs D. Vishnu Murthy, N. Venugopal, Chennupati Wazir, Dr. K. Pattabhiramaiah, Narra Sridhar, T. R. Jagannadha Reddy, Dr. K. Kondiah, and S. Janakirama Raju.